Approved by University Council on April 2015, the Pathways General Education Curriculum includes core and integrative concepts and student learning outcomes to meet the needs of all students. The curriculum is comprised of courses reflecting best practices in pedagogy and evidence of efficacy. The Pathways curriculum has the potential to become a signature program at Virginia Tech, enhancing the student experience and making this institution a leader among peers in providing a coherent and meaningful general education for undergraduates. Allows students to engage in Ethical Reasoning and Intercultural and Global Awareness across the entire curriculum. 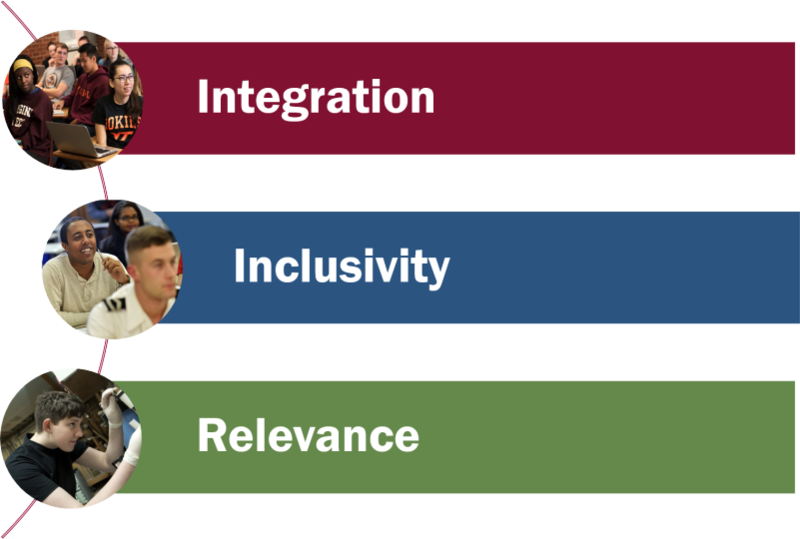 Addresses the needs and challenges of diverse populations of students in inclusive classroom experiences. Supports learning theory and best practices to deliver a curriculum steeped in real-world application and connections among a variety of perspectives and ways of knowing.